For compact- and middle-class, sporty cars and MPVs. General Tire has been developing tires for almost 100 years. All of this experience, precisely aligned to the winter road conditions, has been optimally combined to create the new Altimax Winter plus. ‘Zig-zag’ ribs for optimum winter traction and cornering stability in snow and ice. Wide longitudinal and lateral grooves reduce the risk of aquaplaning and provide traction. Robust tire compound guarantees high mileage. An all-round success and excellent choice for anyone who wants to safely survive the winter in their car! ‘Zig-zag’ ribs for optimum winter traction and cornering stability in snow and ice. The New EU Tyre Label? 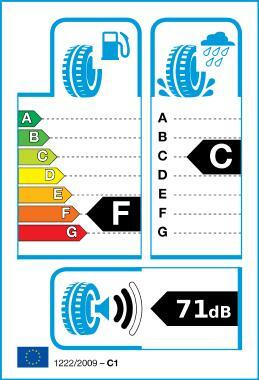 As part of the Action Plan for Energy Efficiency was first November 2012 introduced the EU tyre label . Henceforth, the motor vehicle tyres are fitted within the European Union with this indicator and inform about the fuel consumption , wet grip and noise classification of each product. For you we have compiled all relevant information. The tyre label is divided into three different categories , which are measured separately. The rolling resistance of a tyre directly influenced the fuel consumption of your vehicle. The lower the rolling resistance, the less fuel you consume. The best rating in this category is the letter "A" with the color green , while a red " G" is the weakest of censorship . The letter " D" is not used. From A to G of consumption with each letter to 100km is higher by 0.1 l .
In the wet adhesion, the braking distance is measured on a wet road . The rating goes from a green " A" to a red "G". However, the letter "D" and "G" are not currently in use. In the evaluation was based on a speed of 80 km / hr. From A to F with each letter of the braking distance will be longer . With the volume of noise is referred to , produced by the tyres when driving. Indicated is the absolute decibel value . The evaluation values ââare divided into three classes which are represented by lines to the right of the illustrated ear. The more lines are black, the louder the tyres. A continuous noise of over 80 decibels can lead to health problems.